A group of South Korean scientists developed a new type of gold nano-sized materials to treat hyperuricemia, the science ministry said Wednesday, opening a new gateway for the treatment of diseases such as gout. Hyperuricemia is a phenomenon marked by an abnormally high level of uric acid in the blood. 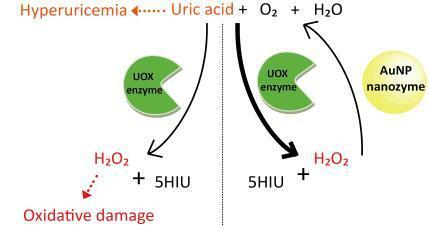 Such a high level of uric acid is associated with numerous diseases ranging from cardiovascular illnesses to gout. The team led by Kwon In-chan of the Gwangju Institute of Science and Technology discovered that catalase-mimic gold nanoparticle nanozyme can effectively treat hyperuricemia without side effects, the Ministry of Science, ICT and Future Planning said. "Because of the great biocompatibility of PVP-coated gold nanoparticle nanozymes, the UOX-AuNP nanozyme cascade systems have great potential for the treatment of TLS and gout," the researchers said in a paper. TLS stands for tumor lysis syndrome.